View of the Gate Lodge with Pittock Mansion in background circa 1917. The Pittocks built the Gate Lodge in conjunction with the mansion to house estate staff. 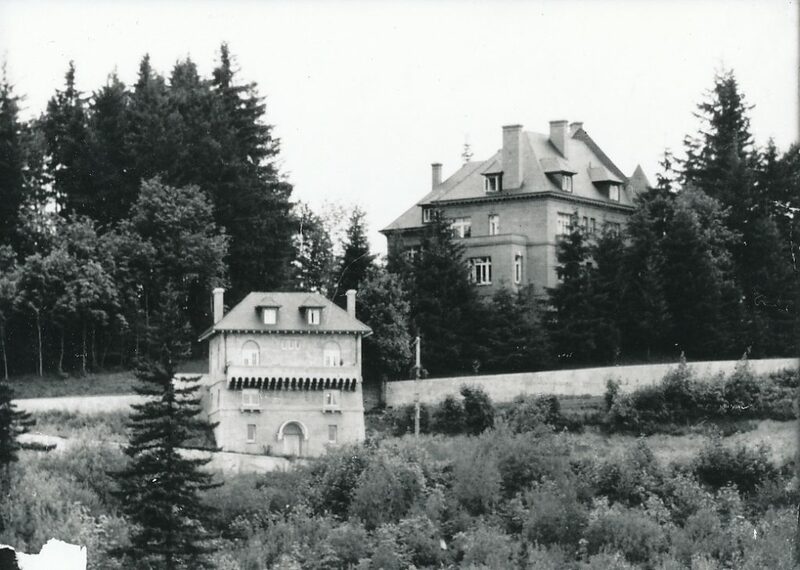 While the splendor of the mansion often overshadows the Gate Lodge, the architectural significance of a four-story building engineered and built into a steep hillside should not be overlooked. While the mansion required substantial restoration when the estate was purchased by the City of Portland in 1964, the Gate Lodge was in even greater disrepair with mold, rot, and cracked and peeling plaster throughout the 1914 home. Workers completed the initial restoration of the Gate Lodge in 1977, and the following decades saw the installation and later removal of catering equipment to accommodate a tea house, roof replacement, and extensive repairs after pipes froze and burst. Pittock Mansion’s Gate Lodge. Erosion of the hillside has destroyed what was once a tiered garden with stairs leading to the exterior kitchen door on the second floor. Today the greatest threats to the Gate Lodge are water intrusion and erosion of the hillside into which it is built. 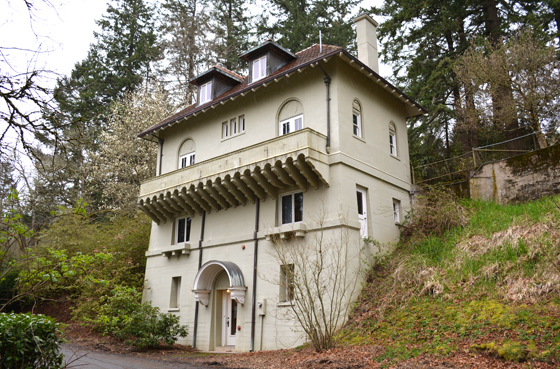 The Pittock Mansion Society is working with Portland Parks & Recreation to engineer a drainage plan that will protect the Gate Lodge and take into account the eroding effects of storm water on the southern slopes of the Mansion’s grounds. The Pittock estate’s rescue and restoration is an inspiring story of what can be accomplished when dedicated citizens value preserving historic buildings and the stories of the people who lived in them.